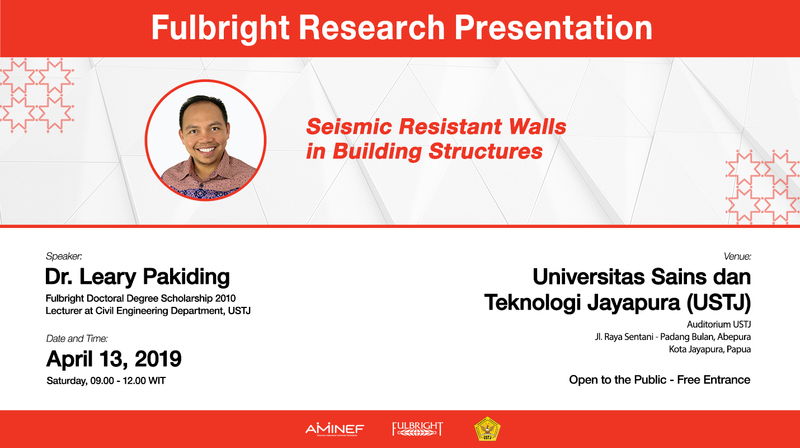 AMINEF and Universitas Sains dan Teknologi Jayapura (USTJ) invite you to a Fulbright Research Presentation on civil engineering entitled ‘Seismic Resistant Walls in Building Structures’ by 2010 Fulbright Doctoral Degree Scholarship Dr. Leary Pakding on April 13, 2019, at 09.00 – 12.00 at USTJ, Papua. 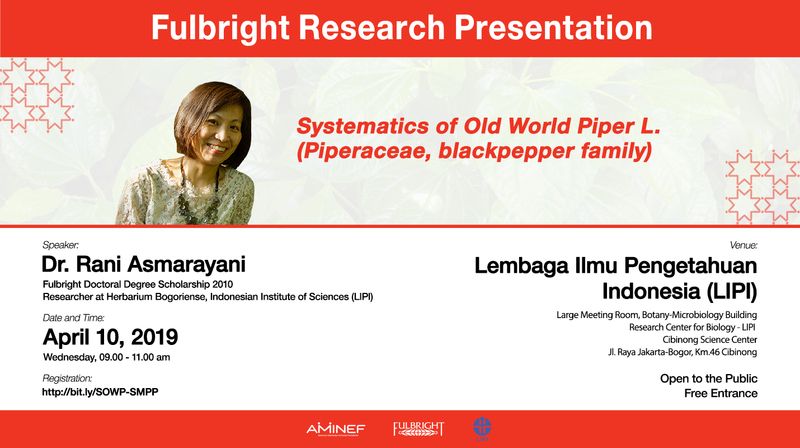 Leary received the Fulbright grant to pursue a PhD in.. Read More..
AMINEF and Lembaga Ilmu Pengetahuan Indonesia (LIPI) invite you to a Fulbright Research Presentation on Biology entitled ‘Systematics of Old World Piper L. (Piperaceae, blackpepper family)’ by 2010 Fulbright Doctoral Degree Scholarship Dr. Rani Asmarayani on April 10, 2019, at 09.00 – 11.00 at LIPI Cibinong. 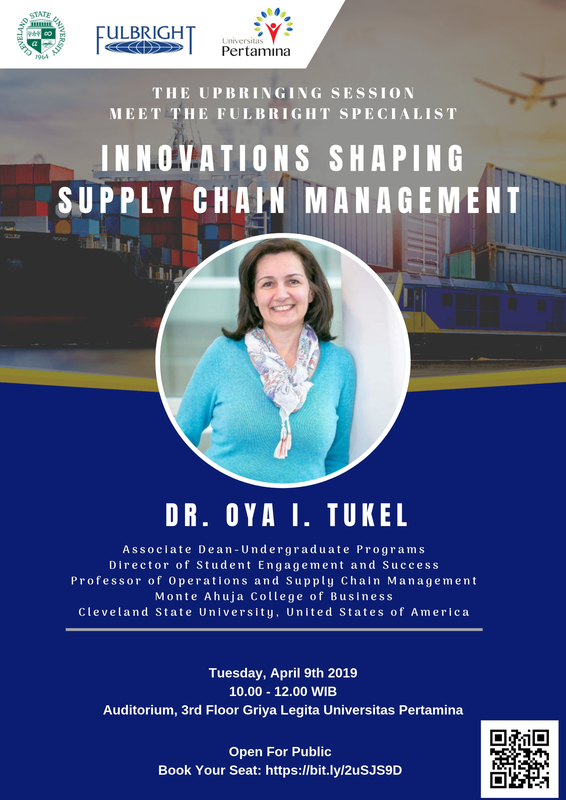 Rani Asmarayani is a researcher at Herbarium Bogoriense LIPI… Read More..
Join Fulbright Specialist Dr. Oya Tukel at a public lecture on “Innovations Shaping Supply Chain Management” held on Tuesday, April 9, 2019, at Universitas Pertamina in Simprug, South Jakarta. Simply register at this link: https://bit.ly/2uSJS9D . 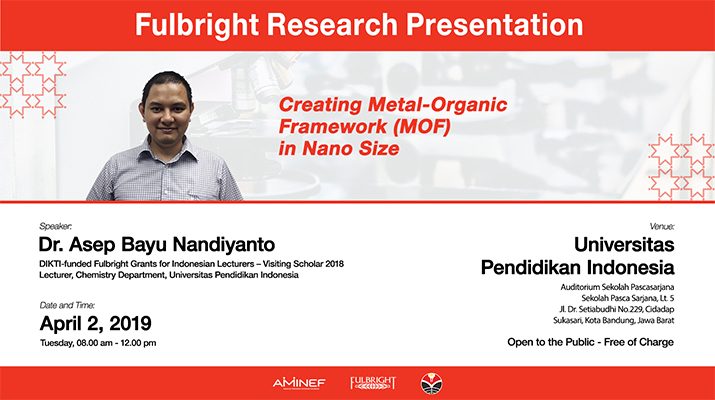 This event is free of charge Read Dr. Oya Tukel profile Learn more about the Fulbright Specialist Program Read testimonies of Indonesian institutions.. Read More..
AMINEF and Universitas Pendidikan Indonesia invite you to a Fulbright Research Presentation on chemistry entitled ‘Creating Metal-Organic Framework (MOF) in Nano Size’ by Dr. Asep Bayu Nandiyanto, 2018 DIKTI-funded Fulbright Grants for Indonesian Lecturers – Visiting Scholar, on April 2, 2019, at 08.00 – 12.00 at Universitas Pendidikan Indonesia, Bandung, West Java. Asep Bayu is an associate professor.. Read More..